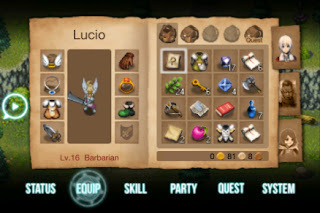 Earlier this year the unfortunately named gaming company Com2uS released a great little RPG for the iPhone/iPod Touch. Following up on the success of the first two entries into their franchise, Com2uS released The Chronicles of Inotia 3: Children of Carnia. Now I know with that title we've just split the party among RPG fans. Those who like to control one character as they traverse a realistic world and fiddle with their skilltree just left the room. Those who like sweeping costumes, large-bird breeding programs, terms like "reset cool down time" and tales of unknown destiny: pay attention. I would normally leave the room with the Tolkien-based, guy in a forest roleplaying experience. That's normally my go-to fun. But with Inotia 3 Com2uS made me an offer I couldn't refuse. Here's why I'm writing about it. The game came out at the start of the year, but up until a week ago it cost the unreasonable (to cheap me, and in terms of app games) price of $4.99. The game is now on sale for 99 cents, and I can't think of any reason why one shouldn't cough up the dollar for this little JRPG gem. In a world where a bottle of diet coke costs $1.49 it actually seems impossible that an in-depth, carefully constructed game like this could cost so little. I downloaded it looking for a time-killer, hoping a 99 cent game could give me a little more depth than Angry Birds Rio (not hard to do). I won't talk much about the story because it does what every JRPG does with its story. It's funny that we have come to accept the tropes of these games, and in my experience if it doesn't follow the basic principles of simple coming-of-age storytelling than it weaves a story so complex you have to take notes. Inotia 3 definitely follows the first route. 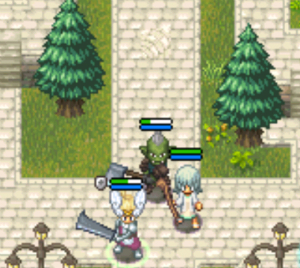 You play as Lucio, a young man who must go through the rite of adulthood. Blah Blah Blah, your best friend and love of your life comes along, you guys kill animals for the town, bad things happen to good people and everyone has a pretty rad adventure. The one interesting thing Inotia does that I've never seen before is a play with time and level. You start as level one, but then there are black and white flashes where you play as a level 40, unnamed character. It gives you a little break from feeling like you're at the bottom of the barrel, and it does enrich the story quite a bit. The gameplay is, for me, what makes this game worth the dollar. It's tap-button, three member party hack and slash, but there are enough buffs and character back-ups to make the battles interesting. You start by choosing a class: Barbarian, Templar, Rogue, Shadow Hunter (Archer), Priest, and Arch Mage. Nothing gets me more excited to dig into a good RPG than researching the various plusses and minuses to playing a certain class, and from my experience these classes seem varied enough to keep it interesting. Suiting up before battle is always a delight in good, heavy JRPG's. Do I want this necklace that grants me .05 percent increase to intelligence, or are my gloves doing enough of that already? The loot dropped feels fair for the level of battle, and I've often been surprised at the good stuff dropped by my enemies. Battle involves placing skills in hot-key slots on the right your touchscreen, with a D-pad on the other side of your screen. I normally don't like this set-up in iPod games, but after ten minutes with it Inotia 3 felt smooth. The response time is perfect and the touch-sensitivity seems very precise. The graphics on this game are bright and exciting. You may only be dealing damage to a cartoon rattlesnake, but damn it feels like you're really sticking it to him! Every power has its own unique animation, and the whole game just feels crisp. All in all this is a game with middling depth but fantastic gameplay. 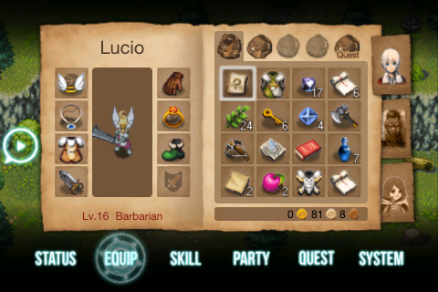 If I would have known Inotio 3 was this entertaining, I would have bought it when it first came out. Now that it's only a buck, I'm glad I waited. Check it out if you've got a long drive to the beach coming up and you need a way to whittle away your hours!